LOVE IS ORANGE's pop'n music banner, as of pop'n music 16. LOVE IS ORANGE's DanceDanceRevolution jacket. LOVE IS ORANGE's REFLEC BEAT jacket. Je t'aime, je n'ai que toi, belle bêtise j'ai fait! C'est dangereux, quand je finirai son jeu? "I love you" "I have nothing but you" ... what a fool I've been! It's dangerous, when will I finish this game? je t'aime je n'ai que toi, quelle bêtise j'ai fait! c'est dangereux, grand je finirai son jeu? mais je dois partir sans dire "je t'aime"
A remix of LOVE IS ORANGE, titled LOVE IS ORANGE (Meggido Mix), can be found on the V-RARE SOUND TRACK 8 CD. A long version of LOVE IS ORANGE arranged by Shunsuke Kida, appears on TOMOSUKE's marble and marble -Re Edition- albums. The DanceDanceRevolution series use a short version of LOVE IS ORANGE, removing the intro. 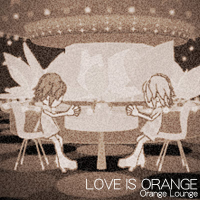 LOVE IS ORANGE also appears as part of pot-pourri d'marmalade from GUITARFREAKS 10thMIX & drummania 9thMIX, a rearranged medley which also features 100sec. Kitchen Battle!! and Marmalade Reverie. LOVE IS ORANGE's video features the Mobo★Moga, Comment te dire adieu, and Marmalade Reverie videos by shiro. LOVE IS ORANGE received a new BEGINNER chart in beatmania IIDX 11 IIDX RED. This chart was removed in beatmania IIDX 14 GOLD. With just 3 extra notes, LOVE IS ORANGE's pop'n music Battle HYPER chart has one of the smallest notecount changes compared with the Battle NORMAL chart. 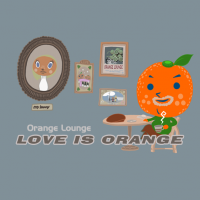 LOVE IS ORANGE was added to pop'n music 10 on December 17th, 2003 via ee'MALL 2nd avenue. Before pop'n music 15 ADVENTURE, LOVE IS ORANGE's songwheel genre was LOVE IS ORANGE. LOVE IS ORANGE has never been on a CS pop'n music release. LOVE IS ORANGE received a unique video in DanceDanceRevolution EXTREME2. This video was carried to the arcade releases in DanceDanceRevolution SuperNOVA. LOVE IS ORANGE is the only Orange Lounge song that is still present in the arcade releases of DanceDanceRevolution. LOVE IS ORANGE received a Double ANOTHER chart in beatmania IIDX 16 EMPRESS + PREMIUM BEST. This chart was carried to the arcade releases in beatmania IIDX 19 Lincle. It also received a Single Black ANOTHER chart on beatmania IIDX 16 EMPRESS + PREMIUM BEST. LOVE IS ORANGE could be unlocked in REFLEC BEAT groovin'!! Upper as part of the 5th Set (TOMOSUKE's SELECTION) of the BEMANI MUSIC FOCUS unlocking system. From September 17th, 2015 onwards, it could be purchased from the REFLEC Shop for 3800 Refle. In REFLEC BEAT VOLZZA, it could be purchased in the Garage for 20 VOLZZA KEYs. LOVE IS ORANGE received a new jacket in the REFLEC BEAT series, based on its beatmania IIDX video. LOVE IS ORANGE was supposed to appear in the cancelled game カラオケレボリューション BEMANIシリーズセレクション. LOVE IS ORANGE is unlockable in beatmania IIDX INFINITAS from December 8th, 2016, after obtaining 4000, 5500, and 8500 BITs for its NORMAL, HYPER, and ANOTHER charts respectively. After being removed from the initial release of REFLEC BEAT 悠久のリフレシア, LOVE IS ORANGE was revived on December 15th, 2016. Anyone who grinned at the title was probably raised very well. One of their parents was probably a pretty big romanticist too. This song is definitely a song for that wonderfully moustached dandy in a far-off corner of your childhood memories. So, this song follows in the pattern of the ones before, but also feels like it's taking off somewhere else. Even the lyrics are a little scary, even ruinous. The color orange is a color of madness. This was going to have a generic video at first, but we felt that the video should at least reflect the song's atmosphere, so we hurriedly put together an all-purpose work using clips from past Orange Lounge videos. beatmania IIDX to 10th style difficulty rated from 1 to 7+ (up to 9th style) or 8 (10th style), from 1 to 8+ in IIDX RED, and from 1 to 12 from HAPPY SKY onwards. DanceDanceRevolution difficulty from 1 to 10 from DDRMAX2 to SuperNOVA2, and 1 to 20 from X onwards. ※ Denotes chart is different from the later BEGINNER chart (total notes: 365). This page was last edited on 29 January 2019, at 15:14.